Throughout the Bush administration, liberal Democrats self-righteously made the fatuous pronouncement that "dissent is patriotic." Literally, that means that any contrarian position one might take must occupy the moral high ground, regardless of the nature of that from which it dissents. Since any position may be dissented from, it must be that they consider all ideas to be equal, with the moral differences existing within the people who advocate them. In other words, liberals believe that liberalism is good, for the very reason that it is the philosophy held by liberals. That's why they don't find it hypocritical to now characterize any disagreement with, or criticism of, President Obama as treasonous. Now that there's a Democrat in the White House, dissent is no longer patriotic, because it is no longer the liberal position. Okay, so we already knew that liberals consider themselves to be inherently superior, but patriotic? We're talking about people who routinely accuse their own country of being the predominant source of evil in the world. Since the start of the War on Terror, elected Democrats have called American soldiers terrorists, Nazis and cold-blooded murderers. They've snubbed and insulted our allies, while trying to prevent us from imprisoning, interrogating and spying on our enemies. Having declared America to be defeated in Iraq, they take no pleasure today in being proven wrong. How, then, can Democrat communications director Brad Woodhouse say with a straight face that the Republican Party "has thrown in its lot with the terrorists," and "will put politics above patriotism," just because its members have criticized the awarding of the Nobel Peace Prize to President Obama? Well, he manages to keep a straight face because liberals are never happy. How he can justify saying it is a little more complicated. MSNBC commentator Chris Matthews once revealed that he'd heard Hillary Clinton pledge allegiance, not to the nation for which our flag stands, but "to the America that can be." An incredulous Matthews rhetorically wondered, "What, are we on probation?" To many of his fellow liberal Democrats, the answer is yes. While many voters cared less about what Obama said during last year's campaign than about the way he said it, his liberal base was energized by his calls to "fundamentally transform America." Their so-called "patriotism" is for a country that does not yet exist, other than through the embodiment of the man who has promised to create it. Their "America" is Barack Obama. If, like Mrs. Clinton, you are reticent to pledge allegiance to Old Glory, there is now a substitute flag available, on which the blue field is occupied by an image of Obama. Apparently the 50 stars, symbolizing federalism, are no longer relevant. Of course, if the stars are removed from the flag, that would render The Star-Spangled Banner obsolete as well. Perhaps the America That Can Be will adopt Mmm-Mmm-Mmm, Barack Hussein Obama as its new national anthem. If one's nationalistic loyalties are owed to President Obama, then he cannot himself be unpatriotic. It doesn't matter that opposing America's national interests is an unofficial prerequisite for being awarded the Nobel Peace Prize. It doesn't matter that Obama already knew about the advancements being made in Iran's nuclear program before he pulled the plug on our missile defense shield. If conflicts of interest exist between Barack Obama and the United States of America, then it must be America that is the disloyal one. To most of the media, America needed to be validated by Obama's election, and it could just as easily be invalidated by his defeat. To liberals, this infallibility of Obama's mirrors their own, as illustrated from their "dissent is patriotic" mantra. 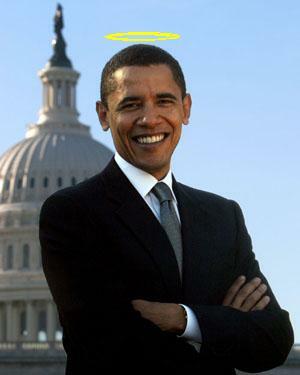 Obama is presumed to be right, for the simple reason that he is who he is. Conveniently, that presumption relieves him of any need to be competent, scrupulous, or wise. John Donne wrote that no man is an island. If he were alive today, to witness the quasi-patriotic devotion that many liberal Democrats have for Barack Obama, he'd have to scratch out that line and start over. As far as his followers are concerned, Obama is not just an island, but an entire nation unto himself. To them, he represents the "people's island paradise" of the future, where they are all headed just as soon as they can find a large enough inner tube. When they go, they will do so with total confidence that the death of the country they leave behind will not diminish them in the least.